Most wonderful, most refreshing, most healthy, most RAW soup ever! I decided tonight once and for all that for a sweet, firm, cold chunk of watermelon, I will kill or die. I mean honestly, is there anything better?! On a 100 degree Baltimore summer day, I challenge anyone to convince me of a better oasis. So you might ask, what could possibly follow such a lovely first course? I’m on this Ayurvedic path of blending flavors; being sure to include elements of spiciness, pungency, sweetness, astringency, bitterness and sourness. 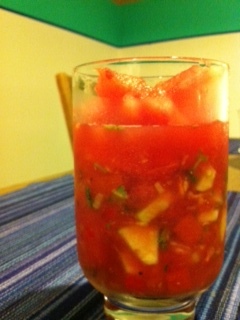 So the heat and sweetness were taken care of in the luscious watermelon soup above. I decided for dinner, I would go raw falafel with a macadamia feta, fermented greens (cheers to BOA! 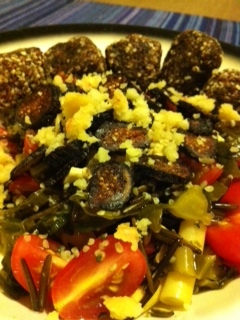 ), pickled green beans, tomatoes, cashews and figs. The falafel is most exciting! I made it with pistachios, carrots, onions, mushrooms and spices, then rolled it in hemp seeds and dehydrated them for a while. YUM. YUM. YUM. And the macadamia feta? Forget about it. Freaking good.